Since its release not quite two years ago, World of Warcraft has been the undisputed market leader in MMOs. It smashed through the formerly unattainable one million user mark and kept right on going, now steaming toward 7,000,000 paying users. 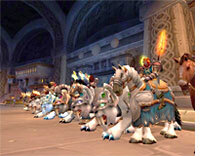 WoW has blown out all previous expectations for MMOs in US, European, and Asian markets and keeps right on going. Last night I logged in to WoW for the first time in a long time. I visited my characters one by one, but didn’t stick around to play very long despite finally having an evening free to play. I felt a distinct detachment from my characters and soon recognized my old friend, game ennui. Now I don’t mean to sound like I’m spelling doom for WoW (or MMOs in general!). Far from it. I don’t know WoW’s sales numbers, but as far as I know their box sales remain at or near the top of the charts. And of course there’s a much-anticipated expansion pack coming up that will give them a welcome, if perhaps temporary, bump in their usage numbers. But in my case, not only could I really not gather any excitement about playing these characters, knowing as I do that I just don’t have multiple hours per week (much less per day!) to play them, but the more advanced the character the more difficult it was to get back into. I could sorta drive my 22lvl hunter; my 37 warlock was almost incomprehensible — and for many more expert players such levels are “lowbies.” Remembering all those spells, weapons, abilities, talents, etc., just seemed like way too much trouble. And all the quests that were driving these characters’ progress were entirely meaningless now (this is the danger of external motivation—it’s just too easy to lose all sense of why I should care about an entirely artificial set of quests). I’m involved, loosely speaking (given my lack of attendance), in several different guilds on PvE, RP, and PvP servers. In each, multiple people I know — both those with multiple level 60 characters and those who have never come close to that — have sort of run aground on the over-and-over again gameplay, whether that’s yet-another-kill-X-creatures quest or yet-another-raid for yet-another-piece-of-armor. No one I’ve talked to dislikes the game; there’s no sense of having been spurned or that the experience has curdled. But in even the best parties there seems to sometimes come a moment when, amidst the music and noise you and your friends silently agree “great party; we’re outta here.” For some people that moment has come with WoW. And I’m guessing that trend is only going to accelerate. So if this isn’t just a local phenomenon — if I’m not just hanging out with multiple groups of all the wrong people — then it seems possible that while WoW continues to be grow (bringing new people into contact with MMOGs all the time), it may be approaching that point where significant numbers of long-term satisfied players nevertheless begin to cycle off. That’s not too surprising given the typical longevity of any individual’s interest in a particular MMO. But if that’s so, then two big questions leap out: where are all these players going to go, and, as I’m so fond of asking, what comes next? I know for example that Vanguard is jockeying for position as WoW’s successor, but I wonder about that. It is supposed to have more flexible grouping and a few other innovations (in addition to expensive and detailed, if perhaps less-than-stunning graphics), but when it comes right down to it, what’s the draw for games like this? Are those struck with WoW-nnui (whether this is their first MMOG or their tenth), who may have taken a handful of characters to level 60 in WoW, and then stuck around or come back to see what’s new on the way to level 70 in the upcoming expansion, really going to be excited to play YAMITG (yet another men in tights game)? If a player has become bored with the by now well-trodden traditional MMOFRPG gameplay, how will another game bring them a new sort of experience, and not just present old dwarves in new clothing? IMO this is the question to which Vanguard, Warhammer, Conan, LOTRO, Hero’s Journey, and any other contenders must have a clear and ready answer. business tips on Types of Armenians? hail damage repair on Types of Armenians?